"Straight out of Topeka, Kansas comes four riff-worshipping bandmates that unite their love of seventies heavy blues, occult-ish doom rock, and a free and easy vibe in what they like to call Stoner-lite. I would have to say that their sound would not qualify as "lite" in my book, in someone else's, maybe. The band's first single "Season of the Witch" is a slithering, hard-driving, and catchy tune that wraps around a tight groove. The vocals reign supreme with their bravado and mighty soaring ability. 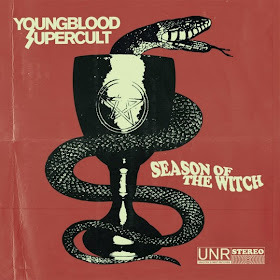 Youngblood Supercult has played alongside fellow Topekians (I hope that's correct) and Heavy Planet favorite The Midnight Ghost Train. The band has a very straight-forward approach and a strong desire to make a name for themselves. Give Youngblood Supercult a listen, you'll be glad you did."